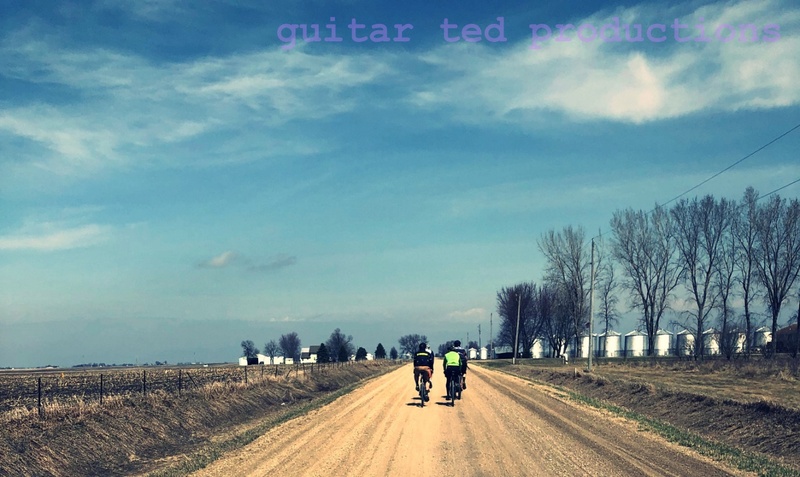 Guitar Ted Productions: The Touring Series: Onward Through The Fog! August 7th: Cedar Falls, Iowa- 6:30am: The tour was set to begin. It was seemingly overcast, humid, and coolish. Everything was drippy with this weather. It seemed surreal, and yet somehow very appropriate. Since this was such a huge undertaking, the fog sort of represented the walking into the unknown. The ends couldn't be seen, nor imagined, since we hadn't a clue just how it would all play out, even though Troy and I had done the tour the year before. All along, Tim had been thinking he might come along, but as he showed up that morning with his bike unloaded, we didn't need to ask what his decision had been. We all took off down familiar westward leading blacktops. Tim was coming along just for awhile as a send off. We reached the black top leading south out of Dike, Iowa, and Tim bade us farewell with tears in his eyes. It was rather uncomfortable, but as soon as he turned around, the fog enveloped him and his bike, and it was as if it were a dream that he had even been there. The fog was super thick, and Troy was concerned. We double checked that our "blinkie" lights were on, but still Troy was not comfortable with riding in such thick fog. His response was to ride harder. So we were almost left behind and Ryan and I had no time to think about cars or fog. It wasn't long before the sun sent the fog packing and a normal, hot, humid August day was in the making. The wind was a non-factor. In fact, we wished for some wind. At least it may have felt cooler. But with or without the wind, it didn't really matter. We were on the road, and we were excited to be riding into an adventure. Along about 60 miles in, we were met with a conundrum as to which road to take. I had chosen a blacktop, but due to the construction of a four lane highway, things were different than my map showed. Troy didn't like the thought of going too far out of our way, because we needed to log big miles westward, not wandering around looking for a black top that took us out of our way. So he insisted we get on an open chunk of the four lane and ride it. I wasn't too keen on this, but it turned out okay. Ryan was pretty quiet this first day. I think he was just figuring it all out, how to fit in and just how to ride this loaded beast of a bike. I can still see him whipping his arm out with flair, reaching for the down tube shifter, making his selection, and whipping his arm back flamboyantly as he pedaled along. It was a signature move he employed every time he shifted his derailleur. Troy was off on the front, as usual. Not to be denied this objective, he was serious and was working hard to keep our average speed up above what we needed to make it. By the time we reached I-35, he was pleased and said as much. He was a bit more relaxed after that, and that was a relief to Ryan and I, as it was cooking our gooses to ride at Troy's infernal pace. Things were slower paced after that and fairly uneventful. Things got a wee bit tense going through Fort Dodge, Iowa due to traffic and route finding. The crossing of the Des Moines River was a doozy! That climb out of the river valley had me off the bike and walking in the heat. Due to the extra time getting through Fort Dodge, we didn't feel too great about the afternoon's mileage. Troy pounded out a furious pace as we set off for a little town west of there called Barnum. It was blazing hot and we were roasting in the late afternoon sunlight. Troy thought about bypassing Barnum because it was off the highway a bit, but he relented and we got to pack it in for the day. It was great to have the thoughts of sleep and rest that would come none too soon! Well, at least I thought it would come. We had done 120 miles that day, and I figured after some chow, we would get some quick sleep. Not too fast there, partner! It was not quite that way! First, the park we were in was about the size of someones small back yard. We didn't have any facilities, and the heat was oppressive! No wind, humid, and mosquitoes were everywhere! We thought we'd just set up our sleeping bags on the picnic tables, but the insects wouldn't allow it. They were eating us alive! So, we all had to get up and set up the tent in the dark. The thoughts of sleeping in that tent were not good, as it was so still and hot yet. Any enclosure would only make it worse. But those mosquitoes! Then the next big moment was the snafu with the then new construction for Highway 20. The corridor through Hardin County had been in dispute for years so parts of the road were complete and others were still just getting started. I remember going through Owasa, Iowa, which was then just a sleepy village in the middle of no where. Now a busy four lane highway snakes right through its backyard. We ended up finding a very suitable round-a-bout which paralleled the new four lane, but we also were forced to take parts of that new road in places. Then it was the Fort Dodge area that proved to be difficult on a hot, sweltering August day with zero air moving. That was a big issue at Barnum, where we tried to get some rest. It was very uncomfortable, but we ended up becoming quite good at being very uncomfortable before this trip was over.